Since the Transglobe expedition’s plans for crossing Antarctica called for a small mobile party, highly skilled in techniques of travel, the possibilities of sophisticated scientific work during the crossing were limited. More elaborate programmes were practicable at the wintering base. The study of Antarctic climatology, that started in 1901 with Scott’s first expedition, has been carried on very intensively over the past 25 years, starting with the International Geophysical Year. Nevertheless it proved possible to add useful knowledge on two aspects of Antarctic climatology. The first was the study of the local climate at Ryvingen, at an elevation of 1920 m, some 300 km inland from the coast. Schwerdtfeger (1970) in reviewing Antarctic climatology, was able to give data on the contrast between coastal stations and stations in a marginal zone within 500 km of the coast for only five stations. Of these, Pioneerskaya (2700 m), Charcot (2400 m) and South Ice (1350 m) were situated on the main slopes of the inland ice, clear of mountainous areas, while Eights (421 m) and Byrd (1512 m), on the lower west Antarctic ice sheet, and Admiral Byrd’s Boiling station on the Ross Ice Shell (8o m) were also in non-mountainous regions. Since Schwerdtfeger’s publication, the gap is being filled by studies of katabatic winds in the marginal zone, mostly by use of automatic stations. It is however of interest to learn whether the climate at Ryvingen differs from other stations within the marginal zone because it lies in a mountainous region separated from the main slopes of the Antarctic Ice Sheet by the wide valley of Penksökka. Temperatures recorded at 1200 GMT at Ryvingen are summarised in Table 1. Mean temperatures for comparable stations on the main Antarctic ice sheets given in Schwerdtfeger (1970) are shown in Table 2 along with the mean 1200 GMT temperatures at Ryvingen. Comparative temperatures using an adjustment of 1.0°C per 100 m elevation and 0.45°C per degree of latitude are also shown. The Ryvingen temperature is 5.9°C warmer than the mean of comparative temperatures at the other three stations. Some, but not all, the difference will be due to the 1200 GMT temperatures being warmer than twenty-four hour mean temperatures. It still appears that Ryvingen is not quite as cold during winter as comparable stations on the main slope of the ice sheet. Full evaluation of the detailed climatic records and comparison of extensive records of winds obtained at Ryvingen with katabatic studies at other stations must be completed if reasons for any climatic differences are to be understood.The records are held at the British Antarctic Survey, pending further analysis. The expedition also helped to unravel another aspect of Antarctic climatology by systematic collection of snow samples at intervals of one degree of latitude during the Antarctic crossing. The ratio of heavy to light atoms of oxygen and/or hydrogen in snow, the isotopic ratio, is strongly dependent on temperature. By measuring this ratio in ice cores drilled from the surface to great depths in the Antarctic ice sheet, we get an indication of how the Antarctic climate changed in the past. Ice cores obtained so far give a climatic record up to around 100,000 years ago. In future, other ice cores should provide a valuable climatic record over at least 250,000 years and perhaps longer. Ice that is obtained from great depths in the ice sheet may have fallen on the surface a long way away from the drilling site at a different elevation where temperatures are different. Therefore to derive a record of past climate it is necessary to apply a correction to allow for the difference in measured isotopic values between the drilling site where the ice core was obtained and the site where the ice fell as snow on the surface. The location where the ice fell can be estimated reasonably well From models of ice flow in the central regions of the ice sheet. We then need to know the distribution of mean isotopic values over the surface of the ice sheet. Although this can be estimated from climatological data, this is not fully satisfactory so scientists have been trying to map the mean surface isotopic values over Antarctica. The route planned by the Transglobe Expedition provided an excellent opportunity for filling a large gap in this distribution map, as is seen in Fig. 1. Samples obtained at around 110km intervals were melted slowly in a pressure cooker. Three 25 millilitre sub-samples of the totaJ melt were then collected in polyethlene vials, labelled and returned for laboratory analysis in Copenhagen. The distribution map of oxygen (18O) isotopic ratios shown in Fig 1 is reproduced from a study of isotopic and temperature distribution in polar ice sheets published by Cambridge University Press in 1983 and titled The Climatic Record in Polar Ice Sheets, (ed. G. de Q. Robin). The Transglobe Expedition samples are marked by a filled triangle. Their figures from the plateau crossing match well with studies shown from other investigators. 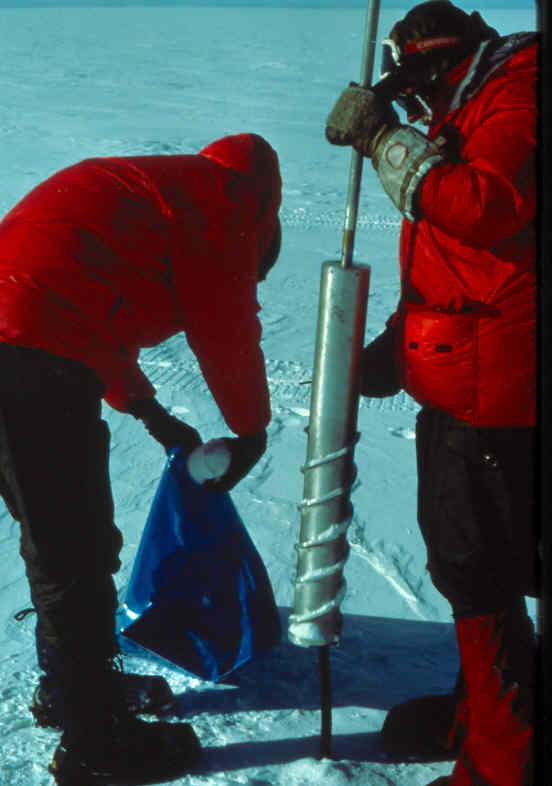 Since it is also necessary to melt ice for drinking water and cooking, the additional time taken to obtain samples at each camp was only that needed to use the ice core instead of a shovel to collect snow, and the time and care taken to bottle and label the samples. The training needed for collection was minimal and the results gave one example of valuable work that can be carried out by a mobile, fast travelling group when data collection is matched in carefully with the other priorities of the expedition. Vol. 14. Editor in chief H. E. Landsberg.